Purists prefer making coffee over a flame, in a metal pot. Even though Armenia's claim to fame is not coffee cultivation, Armenians are famous for their love of the drink. 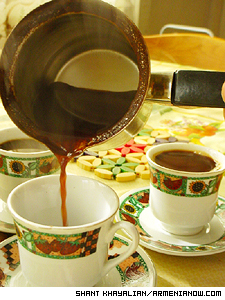 A typical Armenian family begins its morning with a steaming, tiny, cup of coffee. Fifty-two-year old pedagogue Gayane Gevorgyan says, "Every morning I run to the gas-stove with half-closed eyes to make coffee, and this moment seems to last so long. Then I bring my coffee to my bed and sip it slowly. I feel how all parts of my body awake with every sip." Just as many people find it necessary to start their day with coffee, others find it necessary to drink throughout the day. During the years Armenians have adopted this drink as their own, making it more Armenian and national. Parisian Coffee representative Vazgen Asatryan has made his living in the world of coffee for 18 years. He says, "For the first time coffee was brought even to Paris by an Armenian named Pascal in 1710. In Armenia people have been drinking coffee for at least three to four centuries." Historical sciences candidate Armine Stepanyan says that in ancient Armenia women used to grind barley and drink it. In Armenia there is a traditional eastern (oriental) way of making coffee. With slight differences of personal taste, the way to prepare it is: Take one teaspoon of coffee, half a teaspoon of sugar and add one demitasse of water. Of course this simple way of making coffee has its secrets that very few people will uncover. "For me the composition of coffee is the most important. What kind of coffee it is, what kind of water? I would tell that many things depend on water. I don't accept using sugar. The real coffee drinkers drink it without sugar," says Asatryan. Many people prefer bitter and cold coffee. Gevorgyan says, "I drink bitter coffee to feel its real taste. But cream of coffee is more important for me." Then she notes that coffee made on a gas stove is very tasty. She says that one should remove the coffee from the gas fire before it starts boiling. 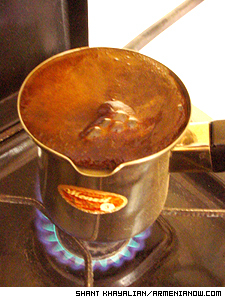 In Armenia it is very popular to make coffee in cheap plastic pots that heat water instantly. The pots brew the drink fast, but purists prefer more traditional means. Svetlana Sargsyan, a 30-year old housewife, says, "If my guests are waiting and I should make coffee quickly, I use a coffee-machine. But usually I make it in an aluminum coffeepot. It tastes different." Whether made quickly in a plastic pot, or patiently over fire, Armenian coffee is dark, rich, potent. Stepanyan says coffee penetrated the Armenian market in 1946-48, when many Diaspora-Armenians from Iran, Syria and France returned to Armenia. "Native Armenians learned drinking coffee from them, though at the beginning they refused to drink coffee and called them bitter water drinkers. But that resistance was short," says Stepanyan. Stepanyan says that the real coffee-drinkers are Syrian-Armenians. "For us it is important that coffee is made by a family girl. They are taught to make coffee since childhood," says Syrian-Armenian (ArmeniaNow photographer) Shant Khayalian. "We make coffee in a little bit different way. We wait til water boils and then add coffee and sugar. We don't mix. We wait til it boils so that the cream on it opens." Khayalian says Syrian-Armenians don't like drinking coffee with cream and use very little sugar. Syrian-Armenians drink coffee in special coffee-cups called 'pinja'. They make their favorite drink in red silver coffee-pots, because it makes coffee even tastier, especially when prepared over coal. Gayane Gevorgyan assures that coffee will be even tastier if you make it on hot sand, a practice of a few cafes in Yerevan. How much coffee do Armenians drink per month? "Every month 300-350 tons of coffee are imported to Armenia," Asatryan says. "Our company alone imports 18 tons of coffee every three months; the other 14 companies import 5-10 tons." He says that the greatest demand in markets is for Arabika, which in fact doesn't correspond to the type of beans used in traditional Armenian coffee. The main part of coffee sold is a low-quality Robusta that is being imported from Vietnam, Indonesia and Asian countries. However, it is possible to find high-quality coffee beans in Armenia. The Parisian Coffee shop sells three classical types of coffee ranging in price from 4,400 drams (about $7.50) to 16,000 drams (about $27.50) per kilo. Having a cup of coffee isn't always just having a cup of coffee. Gevorgyan says, "When we tell each other 'let's drink coffee', it means let's have a pleasant chat. After having a chat, we say 'I wonder what will happen in future?' and tell fortunes by reading the coffee grounds after turning over the cups." According to Armenian tradition, to read coffee grounds, you turn your coffee cup over from the side opposite to the one you were drinking from. You then turn the cup over from three sides to get interesting images. The most desirable and awaited images are balls that symbolize presents in the future. "I always tell nice things when telling fortunes by coffee ground. I see images and start interpreting them," Gevorgyan says. "Coffee cups usually give wings to people. They believe in predictions. And the strong faith makes all wishes come true."